How does it work? To switch execution of a script from PySpark to pysparkling, have the code initialize a pysparkling Context instead of a SparkContext, and use the pysparkling Context to set up your RDDs. The beauty is you don't have to change a single line of code after the Context initialization, because pysparkling's API is (almost) exactly the same as PySpark's. 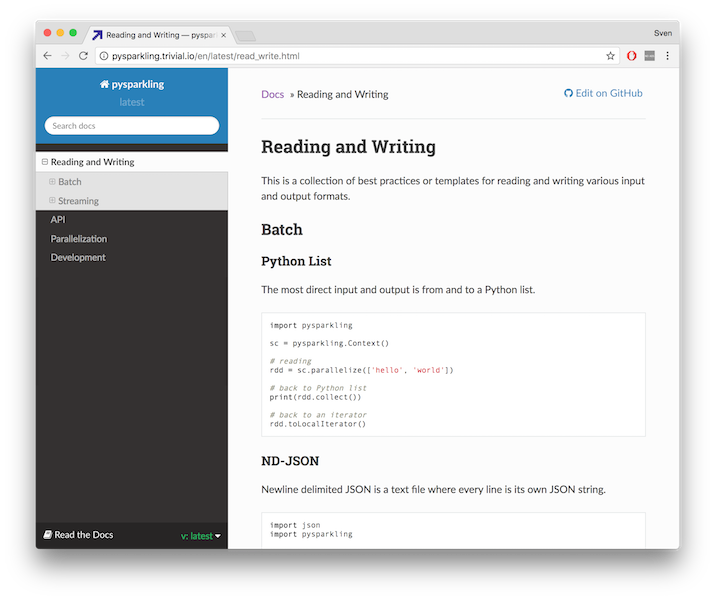 Since it's so easy to switch between PySpark and pysparkling, you can choose the right tool for your use case. When would I use it? Say you are writing a Spark application because you need robust computation on huge datasets, but you also want the same application to provide fast answers on a small dataset. You're finding Spark is not responsive enough for your needs, but you don't want to rewrite an entire separate application for the small-answers-fast problem. You'd rather reuse your Spark code but somehow get it to run fast. Pysparkling bypasses the stuff that causes Spark's long startup times and less responsive feel.